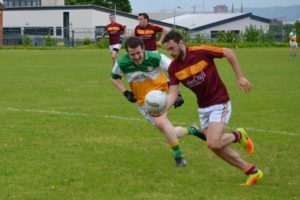 A second half scoring frenzy saw the senior footballers take the spoils against O’Donnells at MacRory Park. O’Donnells played with the aid of the breeze in the first half. The opening 7 minutes of the game was very cagey with both sides trying to gain the upperhand. It was O’Donnells who opened the scoring with a point in the 8th minute and they quickly tagged on another to lead by 2. We promptly replied with points from Niall McParland and Decky Smyth to level. 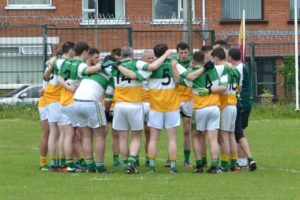 Both teams then traded a brace of points with Padraig McParland and Chris Gallagher on target before an O’Donnells point in stoppage time gave them a 1 point lead in a low scoring half 0-5 to 0-4. We upped the tempo of our play at the start of the second half and we literally cut through the O’Donnell’s defense at will. Our movement was much better and we worked the ball into the scoring zone, creating many scoring opportunities. We took command of the game and in a 14 minute spell we had scored 1-6 with out reply. Decky Smyth was on target with 1-3, and points from Gerard Nugent (f), James Lindsay and Padraig McParland. An O’Donnell’s point was not enough to stem our attacking threat and two points each for Gerard Nugent and Decky Smyth stretched our advantage. The final 10 minutes saw us add points from Niall McParland, Danny Wallace and Gerard Nugent while O’Donnells kicked two points to leave us convincing winners 2-13 to 0-8. An excellent performance which showed that we have strength in depth in the squad. We were solid in defense and broke at pace causing O’Donnells many problems and a return of 2-13 could have been a lot more if it hadn’t been for their keeper who pulled of several outstanding saves and if the post and crossbar had not come to their rescue.